Each year, millions of visitors come to Lake Tahoe to relax on its azure waters and hot sandy beaches or, when the conditions are right, to get a taste of some Sierra snow and truly astounding winter downhill. If Lake Tahoe were a national park, it would be in the top five most-visited parks in the nation, coming in just shy of Yosemite National Park’s annual numbers. With a lakeside elevation of 6,225, Tahoe is high enough and deep enough to maintain legendary water clarity thanks to the perennially frigid water temperatures. Numerous shallow bays offer swimmers some respite from the cooler water temperatures, and the broad, sandy beaches are ideal spots for families to spend the day. Average summer highs flirt with 80 degrees, and the cool mountain air always brings the nighttime average temperatures down to 40 degrees. These ideal temperatures and an idyllic setting combine for some large crowds in summer, but if you can find your own piece of this paradise, you won’t regret it. The peaks that surround and help feed this basin are equally remarkable and are home to some legendary backcountry terrain, mountain bike trails, and hiking routes. By far the vast majority of Tahoe’s visitors flock to the lake, so your best chance for a little summer solitude is to embark on excursions that head into the hills. And given the proximity of the ranges surrounding the lake, your commute need not be far. Similarly, the downhill ski resorts are a gift to Tahoe’s backcountry fans, as they absorb virtually all of Tahoe’s winter skiing traffic. While you may not be alone on a cross-country ski, snowshoe, or backcountry tour, Tahoe is still an incredibly diverse area with plenty of terrain for you to search on your quest for serene winter scenes. For this year-round haven we’ve put together some year-round adventure opportunities that showcase some of the best of what the Tahoe area has to offer. From hot springs and swimming holes to summit views and steep chutes, you’ll find something here to put on your wish list. Also, remember that you can check out adventures that are a little farther afield by having a look at our Lake Tahoe + Northern Sierra Region and our Reno + East Tahoe Region. East Fork Carson River Hot Springs. Photo by Jason Mandly. East Fork Carson River Hot Springs: With plenty of camping opportunities, a nearby river for cooling off, and two pools with different temperature levels, this spot is a great find. Getting there may take a little walking, but that only adds to the adventure. 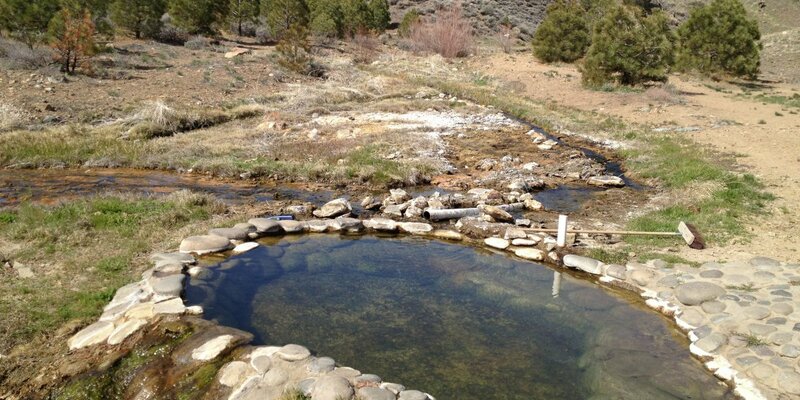 Grover Hot Springs: The hot springs remain open year-round, and they offer a scenic mountain setting in which to relax following a summer hike, autumn aspen viewing, or a winter snowshoe excursion in Grover Hot Springs State Park. Sierra Hot Springs: In addition to the hot springs, this resort offers lodging and camping accommodations, meals, health and wellness workshops, and custom retreats. A beautiful beach awaits at the end of the Secret Cove Hike. Photo by Brandon Katcher. Secret Cove + Chimney Beach Loop: A 2.6-mile hike that rewards with spectacular views of the lake from a quintessential white sand and boulder beach. Rubicon Trail Hike: This lake-oriented, moderately level trail offers an intimate look at Tahoe’s blue waters from elevated vantages that hug rocky precipices and lakeside sections near the water’s edge. Add in the D.L. 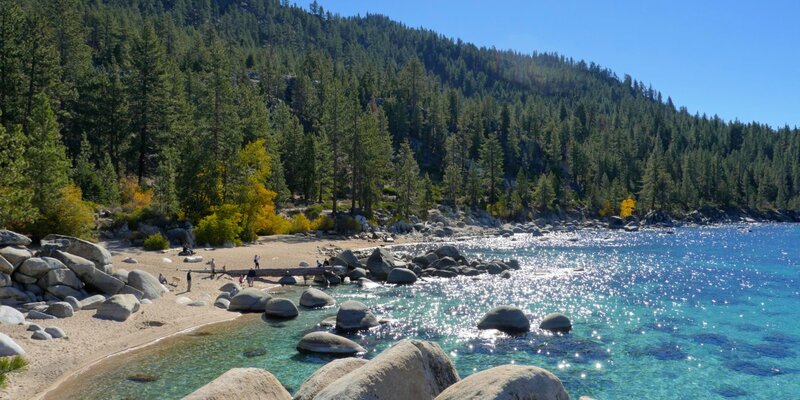 Bliss State Park and Emerald Bay attractions of Rubicon Point, Vikingsholm, and state park beaches, and you’ve got one of Tahoe’s premier hikes with a fantastic itinerary in store. Mount Tallac, Summer Trail Hike: Just shy of 5 miles, the trail meanders past lakes and through forests, climbing bowls and ridges to gain the summit nearly 3,300 feet above the trailhead. The 10-mile round trip takes most hikers around six hours, including time to soak in the panorama on the summit. Five Lakes Trail Hike: This 4.8-mile trek is one of the most beautiful hikes in the Granite Chief Wilderness Area. Allow yourself plenty of time to explore the terrain and find your favorite lake. Eagle Lake Hike: Eagle Lake is a family-friendly destination for soaking in the scenic alpine setting that rises above Emerald Bay. Just a mile in from the trailhead, the Eagle Lake Trail rises gradually as it follows the Eagle Creek drainage. Scuba lessons in Sand Harbor State Park. Photo by Brandon Katcher. D.L. Bliss State Park: Typically open from May through September, D.L. Bliss caters to summer visitors with the beaches and clear waters of Calawee Cove and Lester Beach. With easy access form both the campground and day use parking area, both beaches are well suited for families and for the launching of personal water craft. Emerald Bay State Park: Tucked into the southwest corner of the lake, the long bay opens up inside the narrow mouth at Emerald and Eagle Points, and its shimmering emerald green to azure blue waters beckon boaters, swimmers and hikers to explore its shoreline. Emerald Bay State Park is well known as the home of Vikingsholm, an impressive historic Scandinavian mansion turned museum, and the bay contains the only real island found in Lake Tahoe's waters. Sugar Pine Point State Park: This beautiful but once private property overlooking the “Jewell of the Sierra” has been open to the public as a day use area since 1965 for all to enjoy. 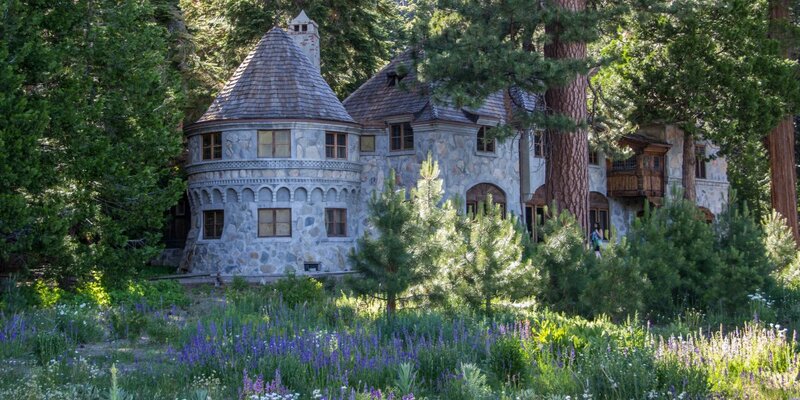 Originally developed as a mountain retreat in the early 1900s, the park’s grounds are part of one of the early and well-kept Tahoe estates centered around the 11,000-square-foot Ehrman Mansion (also known as Pine Lodge). Sand Harbor State Park: With a beautiful, family-friendly beach, a visitor center, kayak rentals, and short hiking trails, there are plenty of reasons to spend the day at this state park. 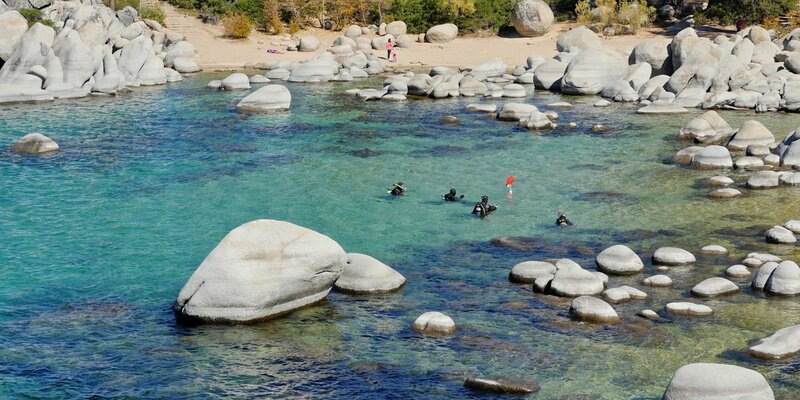 Granite boulders extend offshore from Speedboat Beach, doubling as picture-perfect sunning rocks and swimming platforms. Photo by Aron Bosworth. Meeks Bay Beach: A fine place to spend a warm summer day, horseshoe-shaped Meeks Bay draws campers, swimmers, and beach goers to enjoy the clear waters and recreational opportunities found in the area. Speedboat Beach: Found near the end of Brockway Point just west of the state line, Speedboat is a popular neighborhood beach that fills up quickly during the warm summer months. The beach is well suited for families and those exploring the Kings Beach shoreline with stand-up paddleboards and kayaks. Kings Beach: A great location for families, this beach offers 979 feet of beautiful golden sand and views of the entire lake, all right next to the town of Kings Beach. Round Hill Pines Beach: Round Hill Pines has a myriad of accommodations and activities, including rentals of everything from sea-doos and kayaks to umbrellas and chairs for those just looking to relax. Vikingshom. Photo by Aron Bosworth. Stateline Fire Lookout: Overlooking Crystal Bay, high above the casinos, resorts, and the California-Nevada state line, the Stateline Fire Lookout is one of the best lake views along the north shore. Memorial Point Overook: Located in Lake Tahoe State Park, this easily accessible spot features great views of the lake from the Nevada side, fishing platforms, and countless granite boulders along the shoreline. Eagle Rock: A short hike along a designated trail from Highway 89 climbs 250 feet up the south and west edge of Eagle Rock, gaining its summit. The trail is approximately a half-mile long, finishing at one of Tahoe’s top panoramic views, a surprising reward for such an easy hike. Eagle Falls: Consisting of two separate sets of falls, Upper and Lower Eagle Falls (40 feet and 170 feet respectively), Eagle Falls can be taken in as either a roadside stopover or along one of two hikes. Vikingshom: Located at the head of scenic Emerald Bay in Lake Tahoe, Vikingsholm has come to be known as one of the most impressive pieces of Scandinavian architecture in North America. Inspiration Point: A nice viewing deck and walkway augmented with interpretive signage gives visitors fantastic views of the mountainous terrain surrounding the bay, as well the notable landmarks of Emerald Point and Fannette Island (and the remnants of its summit-perched tea house), and beyond to Lake Tahoe proper. Mount Tallac summit at 9,738 feet. Photo by Shaun Hunter. Donner Peak + Mount Judah: Add a little snow and this popular dry-season hike is transformed into a less-crowded trek. Expect some moderate climbing along with a few short scrambles that open up to views over the Donner Lake basin along with the Summit Valley and Donner Pass areas. Martis Peak: The trail to Martis Peak is around 4 miles of steady climbing through dense snow-covered forest, but for those who stick it out, the old Martis Fire Lookout just below the 8,749-foot peak provides a break from the outdoor elements and provides a panoramic view over the Lake Tahoe Basin, the western Sierra peaks, and northern valleys and summits. Andesite Peak: The climb to 8,219-foot Andesite Peak leaves from the same trailhead as Castle Peak and the Peter Grubb Ski Hut, and it offers a less-popular path that rewards with panoramic views of the Sierra from the peak. Be prepared for some climbing. 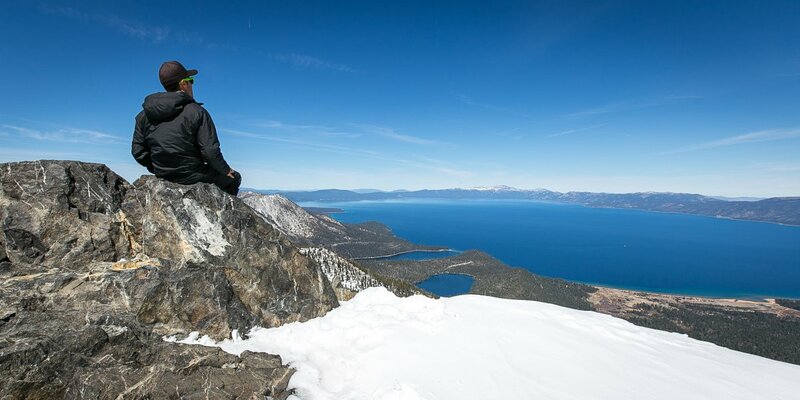 Mount Tallac: One of Tahoe's premiere hikes in the summer, the winter hike is strenuous and may require some wayfinding, but the views from the top make every step worthwhile. The Glen Alpine Trail is a longer and more gradual approach to the summit. The views from Jake's Peak. Photo by Aron Bosworth. Red Lake Peak, Crater Lake Descent: One of the prominent peaks rising above the Carson Pass area, Red Lake Peak offers the backcountry skier a diversity of terrain ranging from long open faces to steep, cliff-lined bowls. Powderhouse Peak: Named for the long-lasting powder stashes found here throughout winter, Powderhouse offers a great diversity of terrain, including an enticing rock-lined east-facing bowl that can be observed from the pullouts along the highway. Jake's Peak: With a minimal approach to reach the skiable vert, a diversity of terrain that includes steep glades and chutes, and 2,000-foot descents over Lake Tahoe’s mesmerizing blue waters, one tour here keeps you coming back for more. Rubicon Peak: Scenic tree skiing doesn’t get much better than the 1,500-foot shot below Rubicon’s summit, where well-spaced glades allow skiers to open up and link continuous turns above Lake Tahoe. A campsite with a view of the lake in D.L. Bliss State Park Campground. Photo by Aron Bosworth. D.L. Bliss State Park Campground: One of Tahoe's most beautiful state parks is also home to one of the area's best campgrounds. Much of the park’s 165-site campground is within a half-mile walk to D.L. Bliss’ popular summer beaches, Rubicon Point and the Rubicon Trailhead. Tahoe State Recreation Area Campground: While not the most remote campground, this spot can be a great choice for families. 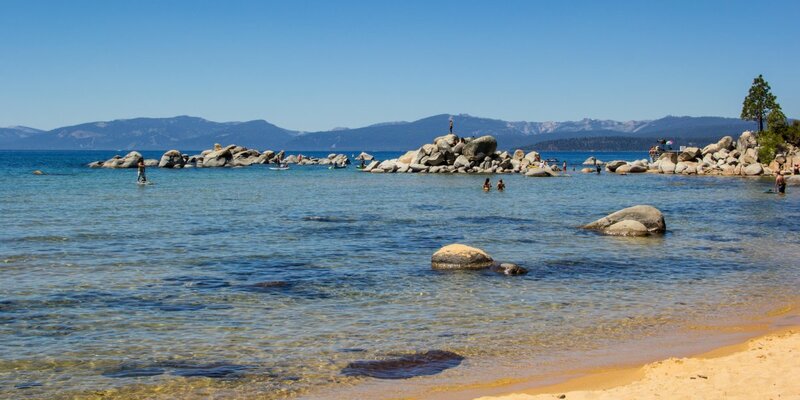 Beaches are easily accessible, as are the many amenities near Tahoe City. Meeks Bay Campground: Nestled between Sugar Pine Point and D.L. Bliss State Parks, campers staying here have nearby access to all the west shore's recreation splendors. 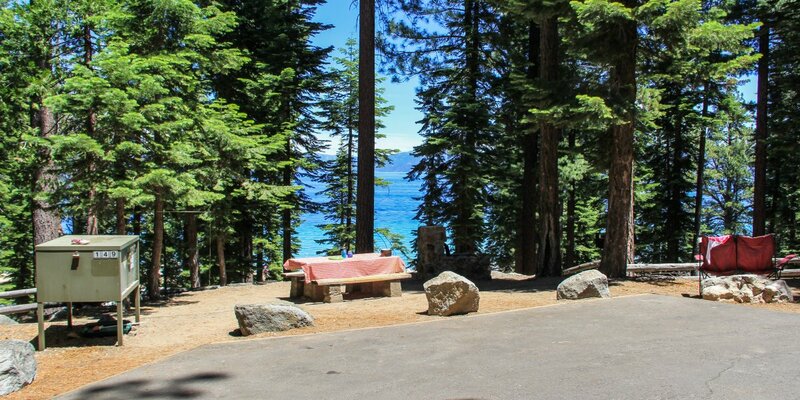 Bayview Trailhead Campground: This campground offers an affordable first-come, first-served option that offers direct access to a beautiful area of Desolation Wilderness above Lake Tahoe’s Emerald Bay, so it shouldn’t be overlooked. General Creek Campground: Set in a pine and cedar forest, the campground is located across Highway 89 from the Sugar Pine Point's lakeside day use area and its beautiful stretch of beaches.